This is one of the first things we learned about Amy and Richard, and we knew right away that they were one adorable couple. 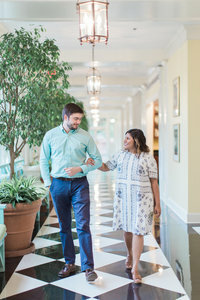 Between Amy’s emails during their engagement that kept us laughing more often than we care to share and their sweet engagement session after which Richard insisted on a print that had their pup, Loki, in it, we have grown to know and love these two. Their wedding was such a beautiful celebration. Surrounded by their closest family and friends at Merry Hill in Mebane, North Carolina, they sealed their commitment to each other with a sip of the rosé wine they created during their ceremony and, of course, a kiss. Amy’s details: she made her robe herself and she was crazy about her shoes (we don’t blame her!) which we loved photographing! The way Richard looked at her during their first dance (a foxtrot!) that was so well done and ended in a perfect dip! Badminton and corn hole at the reception! We love when guests are clearly having a great time at the reception! Amy and Richard played the shoe game and Amy’s reaction to “Who is the worse driver?” was hilarious! The dance party and ribbon wand send-off with the friends and family who remained was so sweet! Amy and Richard, thank you so much for allowing us to be a part of your special day! We loved celebrating with you and hope you had so much fun together! We wish you the best for a long and happy marriage, and we hope you love these pictures as much as we do — we think they look pretty ‘nice’ too! A huge thank you to Bustld for publishing this wedding. You can head here to see the feature! Want to see more Radian weddings? Head here! Thank you to all of the vendors who contributed to this wedding. It wouldn’t have been possible without you!